Speckled Trout Feeding Habits In April Are Unlike Any Other Time. Here we are in April and still dealing with Nor-Easters and chilly weather. Yesterday and today the wind is out of the north and east and is blowing about twenty to twenty-five miles per hour. However, all week we had pleasant weather and the speckled trout was hungry. We caught fish all week on the north side of Barataria Bay on the oyster reefs and around the small islands that are still sticking out of the water. The islands all along both sides of Barataria Bay are slowly disappearing year by year. When the island goes under the water I am still able to fish it for two to three years later. As long as there is an irregularity in the bottom of the bay it will continue to hold speckled trout. It is not until the sunken island goes flat with the bottom of the bay that the trout will stop hanging around the location. All it takes is any kind of structure or hump in the floor and the trout will gather around to feed around the location. Sometimes I will slow down in the middle of a large body of open water and idle forward for about fifty yards or so and then put the power poles down and tell my clients to throw to the west and they look at me like I am crazy. 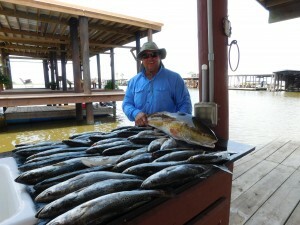 Suddenly, they start catching speckled trout and wonder how in the heck did we do that. They ask me why here, why not any other place in this wide-open body of water. I always like to joke with them for a while before I tell them that we are fishing right on top of a sunken island. I tell them that I just had a notion that the fish were going to be at that spot. That is when they really began to think that I am something special. Of course, after a while I always break down and tell them the truth. They will come a day when we do not have any more islands to fish in the interior bays. That is when I suspect they will be a Hugh change in how we fish this area. I always did believe that speckled trout like to get behind a island or any type of structure that will cause the tide to go around it on one side or the other. When this occurs the trout will recess themselves about twenty yards behind the point of the island or structure and began to feed on the shrimp and other bait feed that is coming around the point. They will get out of the current and take a rest for a while and then get back into the current and feed for a while longer. Learning the feeding habits and feeding locations of the speckled trout is one of the most important things you can learn about fishing. Once you understand how they are thinking and why they feed a certain way around islands and structures then you will know much more about positioning your boat when you pull up to a spot. Now a few more things to point out about boat positioning. If possible, you never want to park you boat to where you are throwing your line into the wind. You never want to park you boat up-stream of the strike zone relative to the tide. Another word never park your boat to where the anchor rope has the bow of your boat facing the current and then go fish off the back of your boat. Your boat will be scattering the live shrimp and other flow of bait feed as it gets to your boat and directly behind your boat they will be no feed for the fish to eat. Finally, never position your boat on a strike zone in such a way that you are looking into the sun. it might now be bad early in the morning, but as soon as the sun gets up a little way in the sky you will began to struggle to see your cork. So, as you can see there is a lot more to going fishing and catching a box of fish. 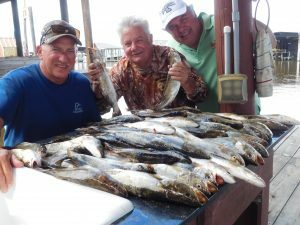 If you are not mindful of all the things that I just spoke of and you are on a charter fishing trip and the captain can make it look so easy to go out and box up a limit of speckled trout. Pay attention the next time you go on a professional guided fishing trip, so you can learn some of the things that the captain is doing that the average person will never recognize. Just a few tricks of the trade you would want to know the next time you go fishing in your own boat. Always try to keep the water in your live well a little on the cooler side. You might want to add a little ice to the water ever hour or so to prevent the water from getting too hot. That will kill your live shrimp quicker than anything. The little bit of chlorine in the tap water will not hurt your live shrimp near as much as the water temperature rising too high. Another trick is, half way of your fishing trip you might want to hold your hand over the drain hole and pull the plunger out, so the water can drain out. You would want to drain about three quarters of the water and then hurry up and fill the live well back up to the normal level. What this will do is to get rid of the elevated levels of ammonia that has accumulated during the first half of the fishing trip. 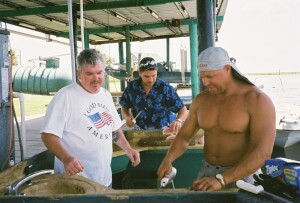 Keeping your shrimp alive and healthy is very important regarding the quality of your fishing trip. Another good tip I like to tell people that are on the water in their own boat is to always try to bring a few ponds of dead shrimp and ever now and then to throw a couple of hand fills over in the direction you are fishing. This will attract the speckled trout to where your corks are hitting the water.